The western hemisphere of Earth is shown in yellow. 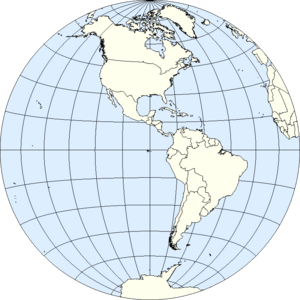 The western hemisphere is a geographical term for the half of the Earth that is west of the Prime Meridian. Pretend that the earth is cut in half, from the North Pole, through England, to the South Pole. The Western Hemisphere is the half to the west. The other half is called the Eastern Hemisphere. Western hemisphere Facts for Kids. Kiddle Encyclopedia.